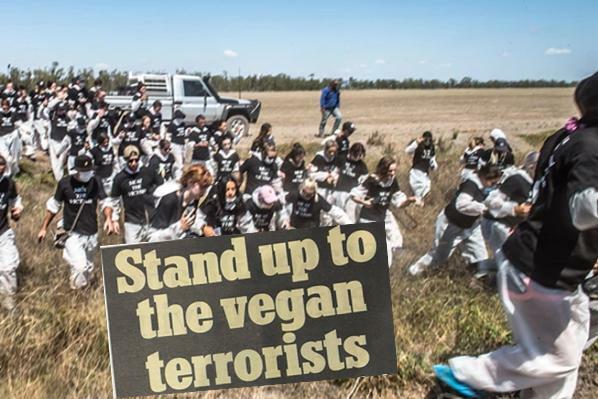 Australia has another home-grown terror group, a zeal of vegan extremists labelling themselves contrarily ‘Aussie Farms‘, which of course they’re not. They target and attack Australian farms, wanting them all ideologically shut down. They want to ban farms and farming. They’re raving leftist loonies! Today, mobs of vegan banshees launched multiple co-ordinated pre-dawn raids on Internet targeted farms and abattoirs in Victoria, New South Wales and Queensland. Their main targets were the MC Herd abattoir in Geelong, the Southern Meats abattoir in Goulburn, and Carey Bros Abattoir in Warwick as well as farms in Windsor outside Sydney. 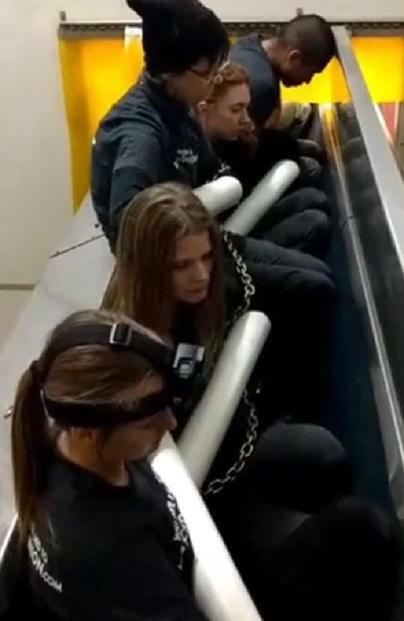 Around 2.30am today, nine anaemic vegans invaded the Goulburn abattoir on Mazamat Road, chaining themselves to a conveyor belt. Some enterprising worker should have started it up – to see how fast the key unlocking would take. Goulburn Police Rescue cut the terrorists off and arrested them. Three unemployed women refused to walk from the abattoir and had to be carried into the awaiting police paddy wagon. 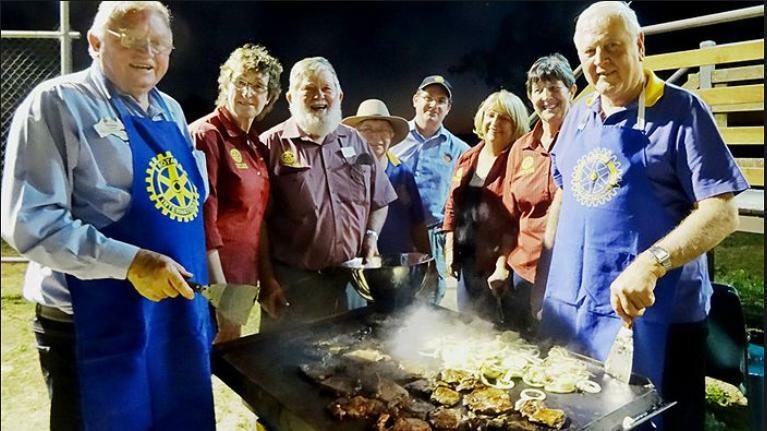 Decent volunteer sympathisers were on hand to offer the anaemic nine – chops, steaks, sausages and burgers – may be with side salad. Three unemployed men, one aged 46 and two aged 22, and six unemployed women, aged between 21 and 61 were taken to Goulburn Police Station where they will be charged. They blocked the entrance to the MC Herd abattoir in Geelong in Victoria. 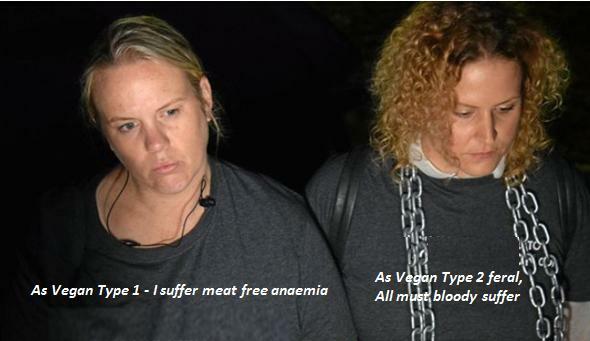 At 3:30am in Warwick in Queensland, more than two dozen feral vegans raided Carey Bros Abattoir and chained themselves to equipment. A mob of more than 200 unemployed others remaining outside the facility chanting some leftist crap. Terror leader Brad King co-ordinated the raid and remains, well unemployed. Farmer David McNamee said he feared for his family as they were alone with no protection during the invasion. He added when he ordered the demonstrators to leave, they ignored him. Another owner of an abattoir in Yangan, just 15 km east of Warwick in southern Queensland, was extorted by the same unemployed extremists. They forced him to surrender three of his lambs else they would escalate their protest and stop production for the whole day. The abducted lambs have not been seen since, but locals suspect that a big meat barbeque held later than day may reveal their demise. Rabble organiser Christine Lee has been arrested and faces numerous counts of trespass and affray. Nine people have been arrested at an abattoir in the New South Wales Southern Tablelands. Apparently, the timing had all to do with marking one year of some propaganda video by the group. 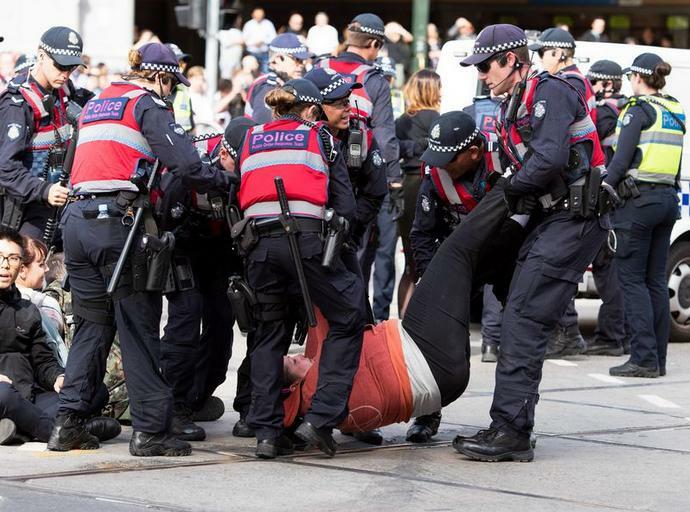 Assorted animal rights activists blocked Melbourne’s CBD intersection outside Flinders Street Station – all for the TV cameras of course. Whenever there’s a political street protest in Melbourne it’s either outside Flinders Street Station or the State Library offers up its front lawns. This cliché protest intersection in front of iconic Flinders Street Railway Station was chosen by islamic terrorist Dimitrious Gargasoulas in January 2017, as well as African rioters of Moomba and Indian students protesting against Indians students murdering Indian students in Melbourne. New South Wales Agriculture Minister Mark Furner said he’d had a “gutful” of activists putting farms at risk and said new regulations were being drafted to allow police and agriculture ministers to issue protesters with on the spot fines. The Department of Agriculture will also form a taskforce with the state police intelligence unit to try and prevent animal activism attacks on farmers. Nationals senator John Williams said there could be “punch-ups” if protesters continued targeting farmers. “Farmers are not violent people. But when these people go out there and cut the fence and let the livestock out on the road, well farmers might get angry,” he told Sky News on Monday. Australia’s Prime Minister Scott Morrison has admonished the group as “un-Australian” and that invading farms and abattoirs was “shameful”. CEO of the National Farmers’ Federation Tony Mahar similarly slammed the behaviour of the protesters, saying it was extremely concerning. 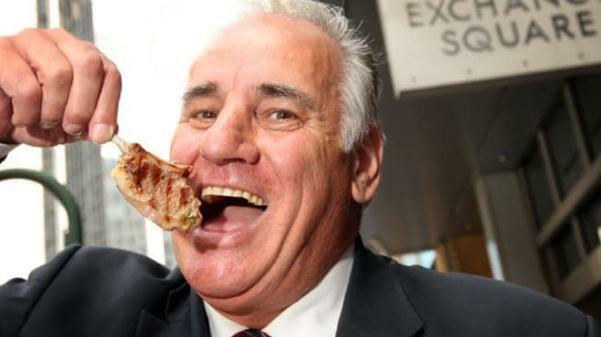 Both Mahar and Morrison continue to support Sam Kekovich’s call for Australians to eat lamb on Australia Day, indeed right throughout Australia Week! Anarchist Greens extremists are hell bent on shutting down Australia to a Third World basket case. Their extreme ideology insists on climate cult alarmism, banning coal, banning gas, banning heating, making electricity unaffordable, banning industry, banning petrol and diesel, banning farming, no Whites, no jobs, and inviting in Angela Merkels hateful welfare hordes. The vegans then cuddle feral foxes! 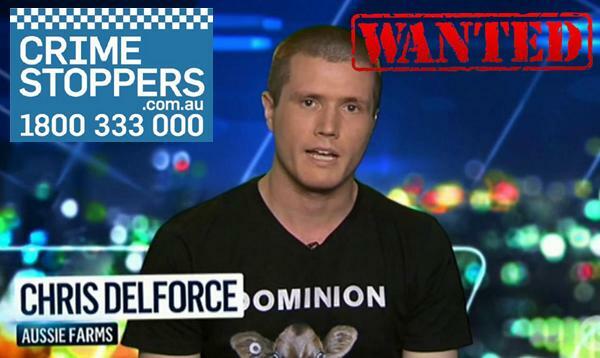 The Centrelink lefties of extremist group Aussie Farms have gone feral trespassing on farms across Victoria, New South Wales and into Queensland in some co-ordinated social media drug-fuelled frenzy. 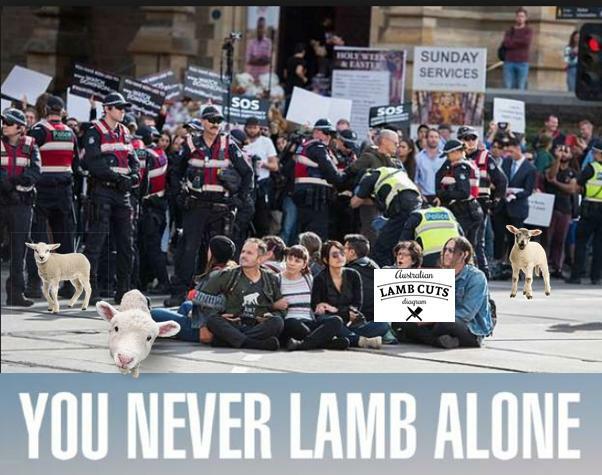 The Greens Vegan Faction has swarmed abattoirs in Goulburn and Queensland, and disrupting traffic in Melbourne’s CBD. Typically the unemployable dial a crowd leftards do the chant: “What do we want? Ban Meat Now!” with some sitting on tram tracks near the Flinders-Swanston St intersection. Police need to arrest, charge them with trespass and affray and photo ID these criminal extremists. They need to be sued for economic loss and have their family’s assets seized, they’re welfare cheques cancelled. Other directors include Matthew Lynch and Melissa Donald. Aussie Farms is clearly involved with criminal activity and this needs to be reported to police and to the Australian Charities and Not for Profits Commission (ACNC). They all need their charitable status revoked. The Animal Justice Party needs to be de-registered as a political party. Aussie Farms Incorporated are located at 3/30 Belmore Street in Ryde (Sydney). Voiceless are located at 2 Paddington Street in Paddington (inner Sydney). Animals Australia are located at 37 O‘Connell Street in North Melbourne. The Animal Welfare League Australia is located at 1605 Elizabeth Drive, Kemps Creek in western Sydney. The World Society for the Protection of Animals is located at 1/2 Northcote St, Naremburn (northern Sydney). The ferals would surely all appreciate a visit from feral pig hunters. In the wake of a woosy fence sitting government and patsy opposition, it’s time that White Australia stood up to the anti-Australian extremism.